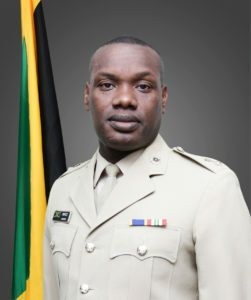 Lt Col Murphy George Pryce was born on 3 October 1976 in the parish of Kingston, Jamaica. The third of four children, he attended Wolmer’s Boys’ School and St George’s College. Whilst in high school he served as 5160 He was a schoolboy cadet for seven years and after graduating he enlisted directly into the Jamaica Defence Force in July 1995. In 1996 he attended a Commissioning Course at the Royal Military Academy – Sandhurst, UK. Major Pryce is a graduate of the Defence Intelligence and Security School, Chicksands, UK; Caribbean Junior Command and Staff College, Jamaica; US Army Military Police School, Fort Leonard Wood, USA; the Infantry Captain Career Course at Fort Benning, Georgia, USA; and the US Army Command and General Staff College, Fort Leavenworth, Kansas. Lt Col Pryce is the recipient of the Meritorious Service Medal. He is also the recipient of the Medal of Honour for General service having served overseas for one year as part of the International Military Advisory and Training Team – Sierra Leone (IMATT-SL). He has also served for two years (2012-2014) as the Military Affairs Specialist at CARICOM’s Implementation Agency for Crime and Security (IMPACS), in the Republic of Trinidad and Tobago, Lt Col PRYCE was appointed Commanding Officer of the First Battalion the Jamaica Regiment on 13 October 2017, having acted in the post for over one year. He has held a number of other military appointments, including Infantry Platoon Commander, Intelligence Officer, Adjutant, Officer Commanding the Military Police Company, Infantry Company Commander, Officer Commanding Administrative Wing (Cbt Sp Bn), Detachment Commander for the Jamaica Defence Force Military Training Wing (JDF Training Depot), and Second-in-Command 1 JR. Lt Col Pryce has much experience in the field of training, having served as Recruit Training Officer and Cadre Training Officer. As Detachment Commander, he had direct responsibility and oversight for the training and professional development of all recruits, Non-Commissioned Officers (NCOs) and Young Officers in the JDF. In 2010 he was attached to the Canadian Forces as a Directing Staff at the Junior Command and Staff Course, Nova Scotia. He was a Directing Staff and also the Standards Officer at the Caribbean Junior Command and Staff College where he coordinated and instructed on various leadership courses. He has participated in numerous regional and hemispheric exercises, which include: PKO North in El Salvador and in Nicaragua; Exercise French Commando in Guadeloupe; and exercise Trade Winds in Antigua, Dominica Republic, Jamaica and Barbados. Lt Col Pryce has done much academic and professional studies. He holds a Bachelor of Science in Human Resource Management. He holds Masters Degrees in the fields of National Security and Strategic Studies; Occupational, Environmental, Safety and Health; Military Arts and Science (Strategic Studies); and, Adult, Occupational and Continuing Education. He is also a certified Project Management Professional. His current academic interest is in Technical Vocational Education and Training (TVET). Lt Col Pryce is married to Anazieke and has two daughters, Victoria Isabelle (VIP) and Michelle Vanessa (MVP). He enjoys listening to music, playing spades, dominoes, chess and most sports.